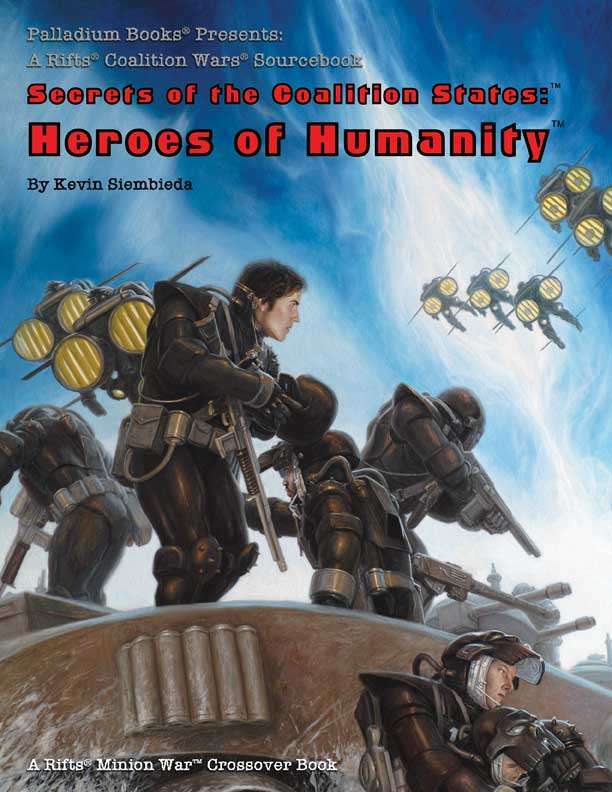 Heroes of Humanity™ is the next chapter in the epic war for the soul of humanity. For the first time in history, the Coalition States, Northern Gun, the Manistique Imperium, Lazlo, New Lazlo, the Cyber-Knights, Lemurians, Free Quebec, D-Bees, mages and many, many others stand together against a common enemy. Meanwhile, the Splugorth of Atlantis, Archie Three, the Republicans and the Vanguard engage in their own shadow war against the invading demon hordes and each other. Never before possible mixed player groups that would otherwise be ideologically opposed, fight side-by-side for the greater good. Ways to upgrade your existing characters. Tables, gear, more. Coalition military O.C.C.s expanded: CS Juicer, CS Combat Cyborgs, power armor pilots, Fly Boys, Military Specialists & more. Coalition innovations like the Death Knight. CS background and secrets, world information and adventure ideas. 160 pages by Kevin Siembieda, Gleba, Clements and others.